Magdalo party-list Representative Gary Alejano has hardened his criticism over President Rodrigo Duterte statement of "I love Xi" and praising China despite of the aggressive reclamation in the West Philippine Sea. He also made mentioned of Duterte visiting through Boao Forum for Asia held in China and failed to attend in the annual celebration of "Araw ng Kagitingan" (Day of Valor). The celebration should be attended by the Chief as a salute to the veterans of war and soldiers. “What is this? fighting for freedom and democracy and yet his absent and he went to China. China is grabbing our island. 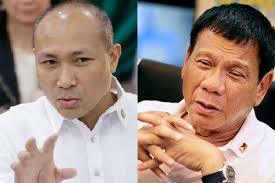 What he did is so opposite," Alejano said.